AE1S Amateur Radio Blog: A very exciting day! 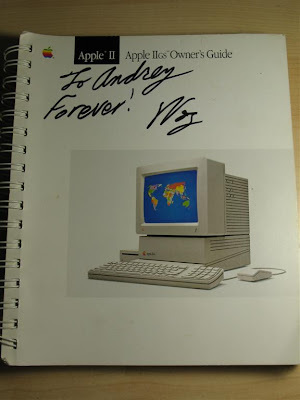 Today, I got the chance to personally meet and chat with the person who is responsible for my career as a computer engineer - the co-founder of Apple Inc. and the engineer who designed the famous Apple I, ][ and III - Steve Wozniak! The guy is practically a legend! Back in the early 80s when I was teenager, I had a poster of him on my wall. Applesoft Basic was my very first programming language! My second one - Assembler for MOS 6502. The first computer hardware I designed was for Apple II. Currently, Steve is the Chief Scientist of Fusion-IO - company creating a revolution in the data storage technology utilizing nano-flash memory. Today, they announced their partnership with IBM as their ioMemory technology will be used in IBM's family of System X servers. It was only fair to show Steve how the Future meets the Past as I handed him my Apple II CFFA project card - a SSD (Solid State Drive) based on CF card for the Apple II family. This project was developed by Richard Dreher - a firmware engineer at Cray Inc. This is my CFFA 2.0 card - I have 90% of my entire collection of vintage Apple II software on the CF Card! (yes! games too - who can live without a weekly game of Pac-Man or Space Invaders). The CFFA (Compact Flash For Apple) supports directly ProDos and GS OS partitions and also supports DOS 3.3 volumes via Dos Master. Well, the card is now officially "Woz" certified! :-) Steve was very impressed with this piece of hardware (tnx Rich!!) but couldn't resist asking me the question - "Why do you guys, do this? What is it about the Apple II?" My answer was - "I hoped that you'll be one of the few who can understand it, Steve". My collection of Apple IIgs computers - the bottom one is a ROM03 machine. The top one - ROM01, Limited "Woz" edition and now *Ultra* Limited edition with the real signature of the Master!